Windows 7 / Server 2008 R2 "Changing the Primary Domain DNS name of this computer to "" failed...."
a] Click Start, Run, type ncpa.cpl, hit Enter. b] Right-click Local Area Connection, go to Properties, click Internet Protocol Version 4 (TCP/IPv4), and then click Properties. 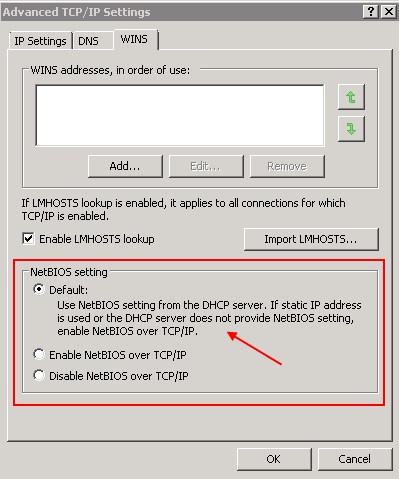 c] In the Internet Protocol Version 4 (TCP/IPv4) Properties dialog box, click Advanced and on the WINS tab, verify Enable NetBIOS Over TCP/IP is enabled. This entry was posted in Active Directory, DNS, Microsoft, Support, Windows and tagged active directory, dns, NetBIOS, primary domain dns, Server, Windows on April 8, 2013 by Adrian Kielbowicz. I have tried your recommended solution but I still get the same error, whats interesting is that my Domain Controller is in the Trust Zone but a firewall separates my network and the DC. Does that mean my firewall will drop any netbios broadcasts and I will continue to get this error because I cannot enable broadcasts to cross my firewall ? Jas, are your machines actually joining the domain or failing and never create any computer objects in AD? Firewall can be an issue but without knowing more on how strict the configured rules are its hard to say. Can you elaborate and expand on this a bit more? Hey Adrian, the machines join successfully to the domain and I don’t see any issues anywhere but that error is making me uneasy as I hope it doesn’t lead to something bigger…the network team says that there are no restrictions between the 2 buildings. Basically the DC is in another building down the street and we are connected via an MPLS link which is highly reliable. It is a brand new setup and every machine I join to the domain shows the same error. If I go to the other building there are errors but since there are no firewall restrictions as per the network team, is there anything else I need to look at to solve this ? ipconfig /all | find "Suffix"
There is something different between your two locations since PCs are not showing any errors when on the same network together with the DC. Can you upload netsetup.log somewhere for me to look at?